First John 1:2: “And the life was manifested, and we have seen and testify and report to you the eternal life, which was with the Father and was manifested to us.” This life was first manifested through the incarnation and human living of the Lord Jesus. It will be fully manifested by New Jerusalem. This eternal life brings us fellowship with God and with one another (v. 3, 7). 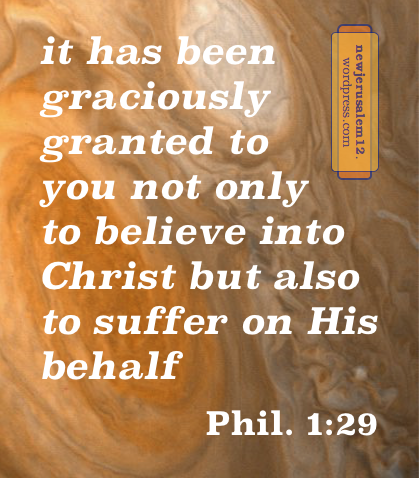 This fellowship is for this time and will continue ever richer into eternity in New Jerusalem. To announce this life to one another is a matter of joy now (v. 4). 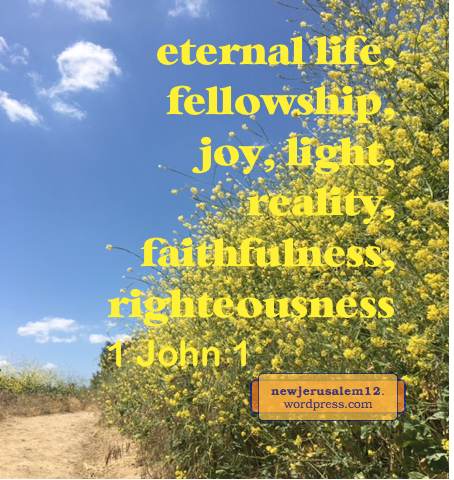 This life will also fill New Jerusalem with joy. Furthermore, in this life we have God, who is light (v. 5). This light is within us now and will characterize New Jerusalem as a city with God in the Lamb as its light (Rev. 21:11, 23). In New Jerusalem there will be no sin, so there will be no further need of confessing sins (v. 9). But, the Lamb will be in the city (Rev. 21:22-23, 22:1, 3) as a reminder that He is the One who “took away the sins of the world” (John 1:29). Verse 8 speaks about the truth (reality). This truth is Jesus Christ Himself (John 14:6) both now and in New Jerusalem. Verse 9 tells us that God is faithful and righteous to forgive the sins we confess. In New Jerusalem there will be no more sinning so no more confessing of sins, but God will still be faithful and righteous, and we will still “openly confess that Jesus Christ is Lord to the glory of God the Father” (Phil 2:11). And we will “see His face” (Rev. 22:4). All of these blessings in 1 John 1 characterize Christian life today and in New Jerusalem. It is a city of eternal life, eternal fellowship, eternal joy, eternal light, eternal truth (reality), and the eternal presence of the faithful and righteous God.